Absolute pleasure staying at Rixos Downtown. The service of the staff, from their warm welcome at check in time and to the accommodating send off at check out time was absolutely awesome. All of the staff had very friendly yet professional approach always checking if we needed anything or if they could help in any way. Especially enjoyed a lot of laughs with Engin Aysal. Every time he would see us, he'd greet us and have a lighthearted conversation and check if we needed anything. No complaints towards any of the staff; everyone was very friendly and accommodating. Rixos Downtown was a very welcoming, comfortable place ! It was luxurious to say the least , it smelt so beautiful in the hotel everyday , the breakfast had a great variety to cater to different tastes, we also had the chance to try the all day dining menu, the portions were alot more than we thought, and it tasted amazing ! It was very clean , our room was cleaned and beds made to a fantastic standard , we also loved the cute little cakes sent to us on two of the nights which was lovely , we didnt have a sea view never the less we had a lovely view of the mountains in the distance. Thankyou for a beautiful stay, I would love to stay again some time ! Great stay and clean. Just a bit old rooms. Renovation of the rooms should be done. The Rixos food is simply amazing, and the service is superb. It was nice to stay there, staff was extremely welcoming and supportive! We found the hotel was very welcoming, the reception staff, guest relations and bar staff were exceptional. The room we were very pleased with, at first we had room near the air condition machinery but we were moved without any fuss to a quieter room. I suggest when hotel is refurbished in future more quality double glazing would enhance guest experience. The free bar in the room was poor, although we only had water, only 1 beer and few soft drinks and No snacks gave a poor image of the hotel. But otherwise the hotel was fantastic, would like evening entertainment. The last thing was business people using the conference rooms, there were a few walking around the lounge talking on their mobiles which disturbed guests so would be nice to have a quiet zone. But these are only small issues and we really enjoyed the hotel and as we only live in Fethiye we be returning a few times a year. Everybody helpful and friendly. Food very good. Maid very good including doing a towel man in various poses in the room and me doing the same in return, enjoyable game! Room service is quick and food good. Allways a great pleasure ! We saty in Rixos 4 -5 times a year, simply because we love the hotel : the service and staff ( many of them recognize us ) is excellent, and so is the restaurant. The interior of the hotel is charming, and the surrounding garden and pool area beautiful. For the first time ever during our stayes in Rixos, we had one big disappointment : the usual restaurant - which we love - was closed 2 for days. Good and convenient facilities, friendly staffs. 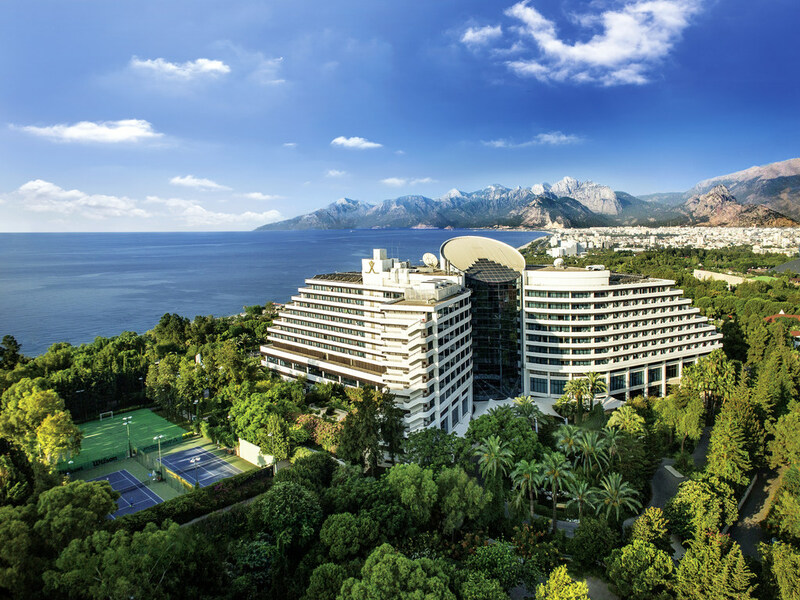 We stay in this hotel evert year when we come to Antalya for Runatolia. Overall, very pleased to stay here. Everything was OK except the temperature in the room: it was too cold and the air condition didn't function. Stuff were helpful. We could not enjoy food and beverages too much, maybe it is because in general food does not suit ours fancy. Furnitures in the room need renewal. All inclusive concept is confusing. It is hard to track which is included and which is not every time. Hotel architecture, design, comfort. Staff and facilities in general are of very good standard. The breakfast is delicious with broad choice. The only thing not perfect is that there is an atmosphere of &quot;this is from the eighties and did not renovate since then&quot;. Still i would recommend this hotel to anyone visiting Antalya. Thank you for the comfort provided! A very good example of a very bad hotel. Room was dust central, dust had settled everywhere. Under and around the bed was filthy with dirt and dust looked like it had been forgotten about. - Bed sheets were filled with dust when we asked the housekeeping the lady could have them changed and very quickly and briefly re settled the dust in the room. Fridge was dirty as well. The bathroom fittings are rusted and looks like the bathroom itself has been cleaned for long time.This is one of the suites we stayed in. For a 5 star hotel these issues are unexpected and very discomforting. Do not think we would like to book with this hotel again! A big failure for Accor Rixos name!